Why Study the Life of King David (and Other Biblical Kings)? IMAGINE you have a friend who, once every week, gathers with a small group of people to study ancient rulers. The group studies Julius Caesar, Alexander the Great, Amenhotep I, etc. You may think that such a meeting is somewhat interesting. But if it became apparent that such a meeting was-to some extent-becoming the focus of your friend’s life, something that your friend is really passionate about (and especially if your friend is not employed as an historian, or planning on seeking such employment), then you may become concerned, and understandably so. Why would someone invest so much energy and gain such passion from studying long-dead monarchs? Aren’t there better things to do with one’s time? Dear reader, if you are a Christian, and if one or more of the church services that you attend every week takes its text from the Samuel/Kings or Chronicles section of the Old Testament, then-in the eyes of the non-religious world-you are in much the same position as your hypothetical “friend” mentioned above. Why would you go week after week and hear sermons about Rehoboam, Abijah, Asa, Jehoshaphat, etc.? We must be clear-in our own thinking first, but then in communicating to others-that when we study the historical narratives of the Bible, we are doing so based upon more than just mere intellectual curiosity. Rather, the history of Israel’s kings teaches lessons that are crucial for understanding God’s work in the world, which is ultimately centered on Jesus Christ. Of course, not all kings of Israel were the same. Soon after monarchy was established in Israel, the nation split into the northern and southern kingdoms. The northern kings were wicked, and to study them is to study rulers of a nation under God’s judgment. God sent prophets-most notably Elijah and Elisha-to confront the wickedness headed by the northern rulers. The record of their ministries demonstrates that the word of the LORD-confirmed by signs and wonders-is active in the darkest of times. The southern kings were mixed: some were characterized by wickedness and others were characterized by doing what was right in the LORD’s sight. These kings of Judah were evaluated in comparison or contrast to King David. For example: 1 Kings 15:3 records of Abijam that “his heart was not wholly devoted to the LORD his God, like the heart of his father David.” 1 Kings 15:11 records that “Asa did what was right in the sight of the LORD, like David his father.” In order to understand what the LORD means us to learn from the other kings of Judah, we must first and foremost learn why the Spirit-inspired authors of the Old Testament so often focus our attention on King David. King David is important, physically speaking, because he is an ancestor of the Man Christ Jesus. But there are many ancestors of Jesus, as recorded in the genealogies, about whom the Bible gives us little information. In the biblical literature, the Spirit-inspired authors focus upon David in particular as an example for us, a type of Christ, and a covenant head. David’s heart of praise, as reflected in his psalms, provides the chief biblical example for how we should worship God in song. When Saul distrusted David’s loyalty, was jealous of David, and tried to have him killed, David called out to God and received protection from Him, thereby becoming an example for how we should approach God in prayer. Even after he was anointed to replace Saul as king, David honored Saul, providing a clear biblical example for how we should exercise submission to those in authority over us. As an example, David is true, yet far from perfect. This means that while we can follow his example, we can only follow it up to a point. We need a better, perfect example: an example that is found in Christ (1 Peter 2:21-22). Though not less than an example for us to follow, David is more than just an example. David is the chief personal type of Christ. When used in evangelical biblical studies, “type” refers to a historical reality of salvific import, which is usually repeated and theologically explored in the biblical narrative, and which finds its fulfillment (or “antitype”) in Christ: His perfect life, the new covenant realities brought about by the shedding of His blood, and the new creation of which His resurrection is the firstfruits. Persons (like Joseph or David). This messianic prophecy was written long after David had died. Yet in speaking of the Messiah through the prophet Ezekiel, the LORD names Him “David.” This is an example of calling the antitype by the name of the type in order that, by considering the type, we may learn something about the character of the antitype. Like David, the Messiah is a servant, shepherd, and sovereign. The function of David as a type of Christ is more clearly seen as we consider the development of the monarchy in Old Testament history. When the good news was first proclaimed in Genesis 3:15, there was no king explicitly mentioned, but God did say that the seed of the woman will crush the head of the serpent, and so the people understood that the Promised One would be a victor in battle, which was one of the primary roles for a king in the Ancient Near East (cf. 1 Sam 8:20b). “Scepter,” “ruler’s staff,” and one receiving “tribute” and “obedience,” all present the picture of a king. Notice the reason Moses, inspired by the Holy Spirit, gave for why the Israelites would ask for a king: in order to be like the surrounding nations. In Samuel’s day, the Israelites did ask for a king. They asked for a king for three reasons. The first two were: 1) Samuel had grown old; 2) Samuel’s sons did not follow in his ways. It was understandable that the people would think to their future leadership and that they would not want Samuel’s sons as leaders. Leading up to the people requesting a king-in the period recorded in the Book of Judges-there had been a continued cycle of people straying from the LORD, being oppressed, crying out to the LORD and being saved, then (despite His blessings) they strayed again. By the final section in the Book of Judges, starting in the chapter after Samson died, there was a sharper downward spiral. In this section the phrase, “There was no king in Israel,” is repeated four times, and the book ends in Judges 21:25 with the statement, “In those days there was no king in Israel, everyone did what was right in his own eyes.” This leads readers to see the need for a godly king. The dire historical situation recorded in the Book of Judges may have, in part, prompted the Israelites in Samuel’s day to ask for a king. In itself, asking for a king did not necessarily have to be a bad thing, if the people had asked with the right heart, humbly asking God to establish a king over them for their good and His glory. Instead, the final reason that the Israelites asked Samuel for a king (the reason nearest to their hearts), was: 3) so that they could be like the surrounding nations (i.e., the Gentiles). This is the very motivation for choosing a king that Moses had predicted centuries before. This wicked motivation for choosing a king led the people to make other mistakes. Wanting a king to be a conqueror, fighting their battles for them, the Israelites chose a man based on his outward appearance-on the fact that he was physically intimidating-rather than considering his heart. Failing to remember Jacob’s inspired words concerning Judah’s descendants, the Israelites chose a man from the tribe of Benjamin. King Saul was a false start to Israel’s monarchy. He was a man who God providentially allowed to take the throne, primarily for the purpose of demonstrating the people’s inadequacy at choosing a king for themselves (so that they might be like the Gentiles), apart from God’s favorable counsel. David, then, chosen by God, became the prototypical king. Once Samuel anointed David as king, Scripture records two early episodes in which God particularly manifested His anointing on David’s life. First is the account in which Saul was persecuted by an evil spirit, and David was able to dispel it (the point of the account is not the harp music, but the harp player). Second is David’s encounter with Goliath, the monstrous individual speaking blasphemies, who David defeats by crushing his head with a [sling-propelled] stone. In these episodes (and others) David acted as a type, finding his antitype in Jesus Christ, who cast out demons and will crush the head of Satan. Before David’s time, the relationship of Israel to God via the Mosaic Covenant was already in a highly doubtful state (at best). As mentioned above, the people had repeatedly fallen away from faithfulness to the LORD during the period recorded in the Book of Judges. (This is not to mention the fickleness of Israel even in Moses’ day.) God would have been more than just to bring the full force of the Law’s curses against Israel long before David was born. In order for God to relate to Israel through means of a covenant (as He intended to do), a new kind of covenant relationship would have to be established. Without supplanting the Mosaic Covenant, which was still in effect, God established another covenant relationship, as recorded in 2 Samuel 7. This covenant was not made with the nation of Israel as a whole-as the Mosaic Covenant had been-but with Israel’s anointed king (David and then his heirs), as a covenant representative of the nation. In verse 11, we see the unconditional features of the Davidic Covenant: the LORD “will not turn back” from His promises to David; God said “I will” establish one of David’s physical descendants on his throne. In verse 12, which begins with an “if,” we see the conditional features of the Davidic Covenant: in order for one of David’s sons to be established on his throne, that son must keep God’s covenant and testimonies (language associated with the Mosaic Covenant and Law); in other words, righteousness was required for one of David’s sons to ascend to the throne. God absolutely intended to keep His promise to David. The stipulation added to this promise was necessary due to God’s holy character. Yet none of David’s descendants was able to fulfill the condition that God had established. They, like everyone after Adam’s transgressed God’s command in the garden of Eden, were sinners, falling short of God’s glory (Rom 3:23). When thinking Christianly, we cannot view biblical accounts simply through the lens of historical curiosity. There are important spiritual lessons that we are meant to learn from the the biblical narratives. David and the other kings of Israel provide examples of faithfulness or unfaithfulness that we should either follow or knowledgeably avoid. Ultimately, however, when we study Scripture, we do so for the purpose of knowing Christ better. 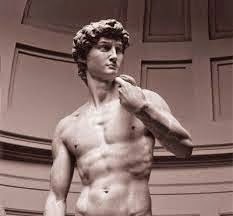 David is an historical figure, but we study him as more than just an artifact of ancient times. David is-in many different ways-an example for us to follow, but we study him as more than just an example. David is a type of Christ and a covenant head. Through studying King David in light of these spiritual realities, we look through the son of Jesse to see the true Son of David: the King of Kings and Lord of Lords, our Savior. N.B. The material for this blogpost was originally published on Andrew Lindsey’s blog: Call to Die.